Once, long long ago . . .yet somehow, not so very long…when all the animals and rocks and winds and waters and trees and birds and fish and all the beings of the world could speak…and understand one another…There began…AN ARGUMENT. 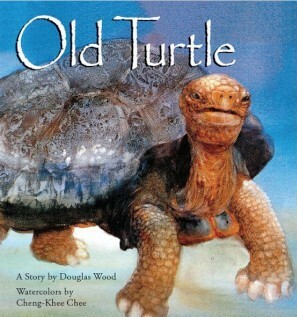 Captain Kangaroo – “For instance, Old Turtle, by Douglas Wood [illustrations by Cheng-Khee Chee], is an awesome book. It takes place back in the times when animals could talk to each other. . . This is the kind of book that could influence young attitudes for a lifetime”.